For all those among us who are presently sniffling and sneezing, seasonal allergies really stink. And 2015 is shaping up to be one of the worst allergy seasons ever.1 Now that the cold days of winter have finally faded away, most people are thrilled to welcome spring's warmer weather. The exception is often the individuals who have hay fever. Seasonal allergy sufferers know that before they can even see the first green leaves on a tree or buds on a flower, their eyes start itching and their noses get stuffy. But instead of dreading the entire season, there might be a way for people with allergies to get out and smell the roses--literally. According to new research, probiotics may help you get through allergy season much more comfortably. The study, which was conducted at the Vanderbilt University School of Medicine in Nashville, Tennessee, found that probiotics may successfully ease the symptoms and severity of allergic rhinitis (aka seasonal allergies).2 The investigation was a meta-analysis of 23 different studies focusing on probiotics that involved a total of more than 1,900 subjects. When all of the data was evaluated, the scientists discovered that probiotics were shown in 17 of the 23 trials to provide a substantial clinical benefit to people with hay fever compared with those who used a placebo. In fact, probiotics were found to lessen the severity of allergies, reduce symptoms, and improve the quality of life for sufferers. The remaining six studies that were examined did not reveal any specific positive effects on allergies in those who took probiotics. But getting back to the studies that offered evidence of probiotics improving allergies, another key benefit in the findings was that there were no major adverse effects reported from the use of probiotics. The same certainly cannot be said for most pharmaceutical allergy medications. These drugs can result in side effects including drowsiness, headaches, insomnia, elevated blood pressure, and irritability. While the meta-analysis was somewhat all over the map in terms of the 23 studies it analyzed--they ranged from investigating the effects of probiotics that came from various food sources as well as supplements, in different quantities, and for varying lengths of time--it was comprehensive enough to show that overall they may be a good way to combat allergies. That is important since allergic rhinitis is estimated to affect 50 million people in the United States alone according to the American College of Allergy, Asthma & Immunology. In more severe cases, the condition can really be miserable and diminish your daytime productivity and the quality of your sleep at night. So, if you want to try probiotics as an allergy treatment, there certainly doesn't seem to be any potential downside. In fact, they may very well improve your health in a number of areas in addition to improving your allergies. But what type of probiotic might be best to take? The current research examined studies that were based on many varying kinds of probiotics, and was not designed to differentiate between them. You can try adding probiotics to your diet in several forms as different strains will benefit your system in different. The bacteria are found naturally in such food sources as yogurt, kefir, and kombucha. If those items are not to your taste, another good option is to take a daily supplement numerous strains of probiotics. 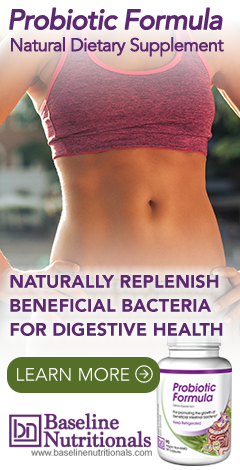 And to learn more about the many health benefits you can receive from probiotics, read Jon Barron's in-depth newsletter, The Benefits of Probiotics--More than Ever.